Selfishly, I thought that nobody knew about the beautiful, cultured, artsy Spanish city of Girona and that I could keep it as my secret place. But it’s impossible to keep a place like this under wraps. I fell in love with Girona and moved here in 2012. This charming, fun, easy-going city checked all my boxes. I can walk or cycle everywhere through beautiful streets that are full of history. It’s full of delicious gastronomy, cheap local markets and regular cultural events to keep me interested. Surrounded by mountains I’m close to nature and if I crave the sea, it’s just a 40-minute trip away. Or in three hours, I can be up in the snowy mountains, whizzing down ski slopes. Girona is also well connected by train and air to the rest of the country and Europe. And my wallet can cope with living here. I rent a renovated apartment with a balcony in the centre of the old quarter. When I visited this part of the city, I admired the colourful houses alongside the river but didn’t think I’d be able to afford it. But I pay $755 a month in rent for my shared apartment. With my love for home cooking and shopping locally, my average monthly expenses are around $790 and my utility bills rarely surpass $160 a month. There are rentals here to suit every budget and taste. You can have a renovated apartment in the old quarter like me, or a new apartment close to Devesa Park (at 40 acres it’s the largest park in Catalonia), or if you’d like more space, you’ll find houses just 15 minutes from the city centre on a hill with stunning views of the city and the surrounding mountains. Prices start at $2,200 a month. Smaller towns in the surrounding area can offer even better deals if you don’t mind having a 30-minute drive from Girona and living next to mountain ranges or beautiful lakes. Even going out for dinner once in a while doesn’t have to break your budget in Girona. One of my favourite streets to eat on is Ballesteries Street, where you’ll find cafes with views to the river serving healthy, delicious and budget-friendly meals. From delightful quiches and fresh juices in the cafe Terra to the stuffed homemade crepes of Crep De Que to delicious Indian food in the Taj restaurant, there’s so much to choose from. Keeping in touch with family and friends back home is cheap and easy. Two companies, Pepephone and Simyo, offer inexpensive and convenient pay-as-you-go plans with good service too. With calls and internet, my phone bill rarely gets higher than $24 and even when I spent some time in France, my bill, with roaming charges, only came to $39 that month. I’m never bored living in Girona. During the day I love nothing more than to wander into the maze-like old streets, along the medieval walls, ending in the gardens where I can read a book under the warm sun. If I’m feeling social, I can go out to a local bar with live music a short walk from my apartment. If I fancy staying in, I can just sit with a cup of tea on my balcony and listen to the street music from the rambla below. Historical sites are my thing, and it’s something that Girona doesn’t lack. I regularly visit the cathedral—its 23-metre-wide nave is the widest Gothic nave in the world and it’s the world’s second-widest church after St. Peters in the Vatican—or walk down to the Jewish quarter or visit old monasteries that are now transformed into university faculties, social centres and theatres. 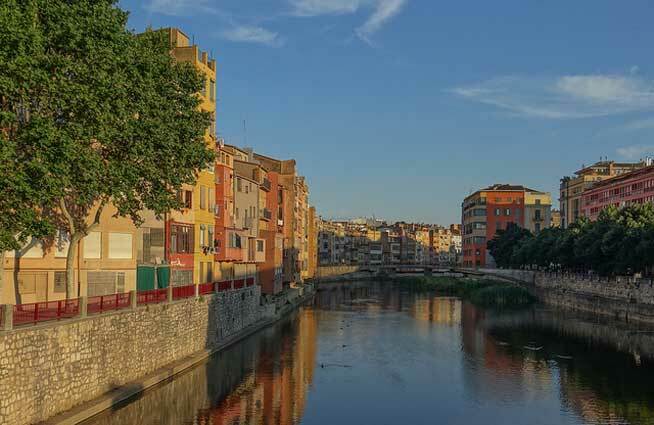 The expat community in Girona is growing and there’s plenty of opportunities to meet the welcoming and helpful locals and expats. Although everyone here speaks Spanish, a little tip is to use a couple of words of Catalan. Your new friends will appreciate the gesture.